Excellence in Community Engagement category sponsored by Rennies Coaches, presented by David Frenz, Operations Director at Stagecoach East Scotland and host Fred MacAulay to MKM Building Supplies. Pic: Kenny Smith. 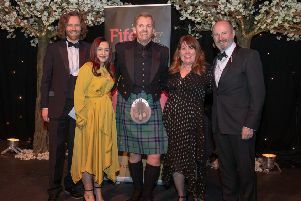 MKM Building Supplies was one of the category winners at the 2019 Fife Business Awards, held last week. The event at Rothes Halls, Glenrothes was attended by 350 guests who saw 12 category winners honoured. Smeaton based MKM won the ‘Excellence in Community Engagement’ category which was sponsored by Rennies Coaches. The judges were full of praise for the team. They said: “Management and staff alike at MKM Building Supplies, embraced a new project that was much bigger in scale than anything previously done, and did it with passion and the conviction that it was the right thing to do for their local community.